It started little more than 2 years ago, when in January 2012, I decided that something had to be done. Its been almost 6 months since my failed attempt to cycle the 2011 Trans Baviaans and I have not run or cycle a single km. I was however fully aware of the main reason for the failed attempt, not a lack of training, but rather trying to cycle up those hills in the Baviaans with 30+Kg excess weight. It would be like doing it now, only with my 9-year old Daughter on my back! To get ourselves started, my friend and I decided to set ourselves a goal and entered an off-road Triathlon only one month away in February. We started to cycle, run & swim almost on a daily basis and as can only be imagined, progress was slow, but we kept on going day after day. 4 weeks later we took part in the event and even thought I felt like I was doing great, only now looking back, do I realise just how distorted my own perspective was. We didn’t stop there and kept on training, with some days being better than others, but the ultimate plan was to finish the 2012 Trans Baviaans I had some unfinished business. The training helped with the weight and by Trans Baviaans Time, August 2012, I was close to a 100kg and almost 10Kg down on the previous year. We tackled the 230Km traverse of the Baviaans Kloof and finished in 18 hours. This was exactly the motivation I needed and the Monday after the event, myself, my wife and my brother-in-law decided that we will enter the 2013 IronMan 70.3. Talk about setting yourself a tough goal! 2013 came and I finished the IronMan 70.3 and decided that I will enter the IronMan in April. My training went according to plan and I finished the race in 14 hours 43 minutes. I had managed to get my weight down to just under 94Kg by this time [a big improvement from a 110kg start], but the moment I started to reduce my training load, I suddenly started to gain weight and by August 2013 I was close to a 100kg again. As my training load increased from September the weight started to come down again, but painfully slowly, almost to the point of loosing hope. By November and with 10, 15 hour training weeks, in preparation for the Salomon SkyRun Lite, I only managed to get down to 95kg. By January 2014 I reached breaking point. I had to buy a new wetsuit for IronMan SA and after managing to squeeze myself into a wetsuit with a maximum weight rating of 94kg [I was closer to 95kg at that time], I new something wasn’t right!! I was training 12+ hours a week, eating right and still I wasn’t losing weight! Driving back from PE that evening, I told my Wife I was ready for the baddest diet pills you can imagine as I was tired of all the effort, with little results, knowing that if I stop or reduce my training, I will simply pick-up weight again. Now you can argue that 95Kg from a 110kg start is great, but I wasn’t feeling / looking great. I will never forget this day, as we were driving over the Gamtoos River my Wife stumbled upon a video interview with Prof Tim Noakes regarding The Real Meal Revolution. Up to that day, we have not heard about it and everything he was talking about, was as if he was describing me training hard, eating right, not losing weight. The very next day I bought the book and started my LCHF Journey. Its not been plain sailing as you can imagine. I made a drastic change to my diet only 8 weeks before IronMan SA and boy did I feel it. 8 days into my LCHF way of life and I was doing a 1-hour indoor interval session on my road bike and hit an absolute all-time low and simply couldn’t help but wonder if I will ever be able to finish IronMan. I was questioning my decision to change my diet so drastically, as I had cut all carbs from my diet, but somehow I just kept on going & doing what I can with the energy Ihad. Well that was the lowest point and from that day, things just changed in the most amazing way. 8 weeks later I was at the start of the 2014 IronMan SA weighting 11kg less!! The wetsuit I bought in January [rated 84 94Kg] was now almost too big for me! I finished the race in 20 minutes quicker than 2013 and felt absolutely great. Getting information on fuelling for a race such as IronMan has been a bit of a struggle, as there is little information available on LCHF race fuelling, but as time passed and I got to Comrades in June, I had obviously adapted to fat in a much better way and managed to simplify my race fuelling strategy to a proper breakfast [bacon, eggs, baby marrows, etc] 2-3 hours before the race start, followed by little else than droewors and my own mixture of nuts and coconut oil during the race. I must however mention that although I cut my carb intake to an absolute minimum normally, I still drink the occasional Coke in the latter stages of the race, as I found it benefits me, whether that is on a physical or psychological level, I do not know. 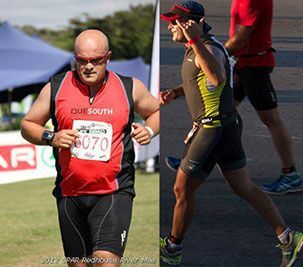 Now 16 months later, at age 42, I weigh 80kg, less than when I got married 15 years ago, I run faster & better times than in my 20’s and in my preparation for Comrades 2015, I can now comfortably do a 21km training run on no water and no food i.e. a full starvation run & don’t encounter any of the previous post-run lows – imagine doing that if you are not fat adapted. My advice to everyone who asks is simple, buy The Real Meal Revolution, read the first 50 odd pages and only then start playing with the recipes and lastly remember this is a low carb / high fat way of living, not a high protein diet and it feels great! Oh and did I mention that my blood pressure is normal for first time in years and I got rid of all my allergies. I am forever grateful to Prof Noakes for having the guts to share this with the world, even though it contradicted everything he once stood for and believed in.